Editor’s Note: This is Episode 13 of the Fresno Poets Archive Project. It features readings from Michael Clifton, David R. C. Good, and Arlene Mitchell Smith, circa 1985 at the Wild Blue Yonder nightclub in Fresno. Background research and closed captioning for this video was conducted by undergraduate student Ernesto Reyes in Fall 2017. He is a senior, studying English literature and creative writing at Fresno State. 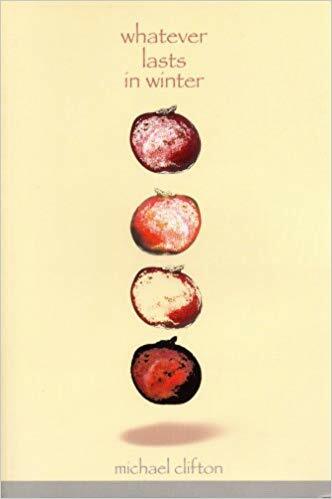 He writes on a regular basis, and he enjoys reading the “descendents of Chekhov,” such as Raymond Carver, John Cheever, Alice Munro–and Chekhov himself. Ernesto plans on pursuing an MFA, and he hopes to write professionally and teach at a community college. Ernesto has lived in the Central Valley all his life, and he attended Reedley College before transferring to Fresno State. 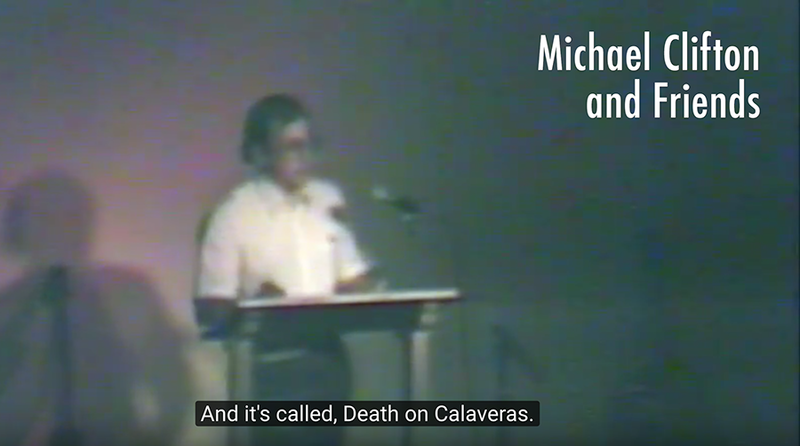 When he discovered, while working on this archive tape, that Michael Clifton was born in Reedley, his curiosity about Clifton’s poetry immediately deepened. Reading the poetry of Dr. Michael Clifton, you become extra aware of how beautiful ordinary life can be. You begin to pay greater attention to the subtleties of everyday life. You learn to appreciate your surroundings and things closest to you that much more. In his collection Whatever Lasts in Winter, I found myself quickly immersed in each poem—beginning with the short and delicate “A Small Thing,” which is about a young boy in the Rocky Mountains with his father, who tries to keep his son warm in their freezing hotel room, to the haunting and beautiful final poem, “In The Back of Our Mind,” which Clifton confirms to be taken out of a dream and sensation he had over the image of a burning flower. On Dec. 8, 2017, I had the great pleasure of meeting and interviewing Dr. Michael Clifton. We met at The Revue coffee bar in the Tower District. It was warm afternoon, the traffic was slow, no one aside from what appeared to be regulars were drinking their coffee, their tea, their espresso. I sat toward the entrance, sipping my large glass of water, looking over my questions to ask him. Clifton agreed to meet me at 3 p.m. I looked to the clock: It was 2:43. It was the first time I’d interviewed a poet. I was there early. I told myself: Be on time, be professional, know your questions, say “thank you,” you’ll do fine, don’t be nervous, nothing to be nervous about, right? Looking back on this, I laugh. As Clifton quickly assured me, there was no reason to feel this way. Excited, yes. Nervous? No. I anticipated the interview to be professional, formal, down-to-the-point, between two individuals: one, a distinguished poet and long-time Fresno State English professor, and the other (me) an aspiring writer and undergraduate student. But quickly, our time together became, for me, a deeply meaningful conversation, between two ordinary people in a cafe. Ernesto Reyes: What was it like growing up in rural Fresno County? Michael Clifton: I didn’t, actually. I was born in Reedley. But my dad was an Army officer and my mother was living with her parents, because my father had gone ahead to Guam in 1949. ER: So there was a lot of moving around? MC: Yes, for the first part of my life until I was about in fourth grade, and then we moved here to Fresno. I’ve been here ever since, except for three years in Bloomington, Indiana, for my graduate work. ER: I was just talking with another professor, and he told me that in twenty years he moved maybe twenty times, so he was always the “new guy.” But he said he always had books to fall back on. ER: You had a similar experience? ER: Do you still read popular fiction? MC: Oh, yes. I read genre fiction continually. I have loads of free time and there are some authors I really like, so I follow them. ER: So if you were to see two stacks of books, one with, say, J.R.R. Tolkien and J.K. Rowling, versus James Joyce and William Faulkner, which stack would you approach? MC: Depends on the mood I’m in. If I’m just looking for entertainment and not interested in working very hard, I’ll head for the genre. But the serious stuff—there are some prose writers who have the ear of the poet. Cormac McCarthy. 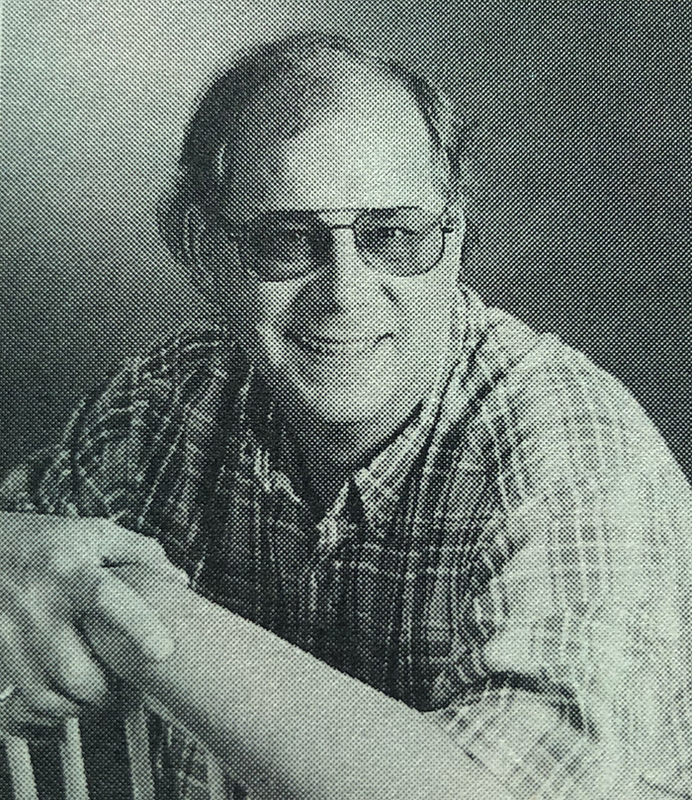 Charles Frazier, the guy who wrote Cold Mountain. Dear God, he hears things in that dialect, which is basically my own dialect, that Southern dialect, that I never heard before. MC: One of the things I miss about teaching at Fresno State is reading those passages out loud. Virginia Woolf. Cormac McCarthy. I miss reading that stuff out loud. ER: What else do you miss about teaching? MC: I miss literary discussions with good students, because they come up with things that’s there in the literature, that’s there in the material, but I’m paying attention to other stuff and completely overlook it. As soon as they say it, you nod your head and say, “Yeah! That has to be right! I hadn’t seen it before!” I miss that—the discoveries you make together in a good class. ER: When did you start writing? MC: I started writing poetry my senior year of high school. My family is bipolar, and I had my first major depression the fall semester of my senior year. Frank Herbert’s Dune saved me because it was a big, serious-involved book, and I’d come home from school … yeah. MC: I had no idea what was happening, with that first crash. ER: Just came out of nowhere? MC: My teacher was so old, she must have been at least 60. She talked about how to write and I was like, well, I already know everything. So I started reading literary anthologies instead. There was a poem by John Keats, and I did not understand the poem, but it was so intensely musical. It hit me right on the head and I wondered: How the hell does he make music out of words like that? ER: Do you still have any of those old poems? MC: Not that I would show anybody. Jesus! How to ruin your reputation! ER: Do you ever revisit some of the stuff you read during that time and feel a bit nostalgic? Reading something you read X number of years ago, but coming at it with a completely new perspective? MC: Oh yes, I love reading Keats. One of the books that’s on my couch next to where I sit all the time is the reading edition of Keats’ collected poems. There’s no one like him. ER: What is the writing process like for you when you are working on a poem? MC: It would depend. A lot of the poems come very quickly. And it still tends to happen like that. A little room in my head that I open the door and listen in to sometimes, and usually I don’t hear anything, but sometimes there’s something. Sometimes, I get a stanza and a half at the beginning, I get a few lines at the end; sometimes I get the whole thing, sometimes I just have to let it out. ER: You took writing workshops with Philip Levine, Peter Everwine, C. G. Hanzlicek, and as a student alongside fellow poets like David St. John and Roberta Spear. What parts of those workshops have stuck with you, as poet and educator? MC: Well, Phil’s example was—he was completely dedicated to poetry, and he was the first and only man I ever heard who said: “Poetry writing is the most important thing you’ll ever do.” No one had ever said that to me before. But because of that, because he was so completely serious, that poetry writing was important, we thought so, too. And we started getting better. In the late ’60s, if you were here—especially if you were an undergraduate—there was no better place to study poetry than at Fresno State. And when I went to Indiana for my Ph.D. and minored in poetry writing, I was a big deal. ER: What is a poem, to you? MC: For me, poetry has always been musical. It’s always been rhythm and sound—and it’s always been those two things together. A poem is a song without instruments, charged with the most meaning you can pack into the language—the most rhythm, the most sound, the most meaning; and when you pull all that together, the poem really does something. People can hear it. If you read the poem right, people can hear that.